And now we move on to the Prophets. Those who announced the coming of the Lord. The people did not say a word. I am the Lord’s only prophet, but Baal has four hundred fifty prophets. 23 Bring us two bulls. Baal’s prophets can take one of them, kill it, and cut it into pieces. Then they can put the meat on the wood without lighting the fire. I will do the same thing with the other bull, and I won’t light a fire under it either. 24 The prophets of Baal will pray to their god, and I will pray to the Lord. The one who answers by starting the fire is God. “That’s a good idea,” everyone agreed. Particularly in the context of beginnings and endings. Do we want to hedge our bets? To say we’ll follow God, but not abandon our ‘other gods’? Are we ready to wholeheartedly journey with God? Or in travel parlance, do we want an open return, just so we can keep our travel plans flexible and change our mind at any moment? Or a season ticket, so we can come and go as often as we want? 31-32 Then he used twelve stones to build an altar in honor of the Lord. Each stone stood for one of the tribes of Israel, which was the name the Lord had given to their ancestor Jacob. 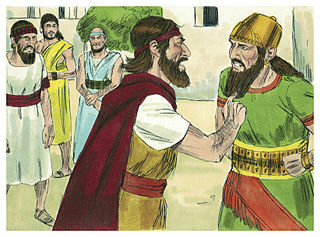 Elijah dug a ditch around the altar, large enough to hold about thirteen quarts. 33 He placed the wood on the altar, then they cut the bull into pieces and laid the meat on the wood. 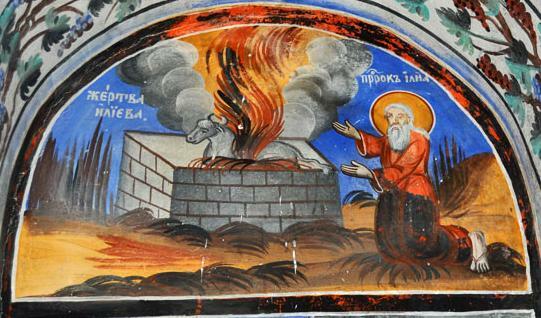 He told the people, “Fill four large jars with water and pour it over the meat and the wood.” After they did this, 34 he told them to do it two more times. They did exactly as he said 35 until finally, the water ran down the altar and filled the ditch. Our Lord, you are the God of Abraham, Isaac, and Israel. Now, prove that you are the God of this nation, and that I, your servant, have done this at your command. 37 Please answer me, so these people will know that you are the Lord God, and that you will turn their hearts back to you. If nothing else, this story is a warning never to challenge God. There’s one of Elijah and 450 of Baal’s prophets; their wood is dry, Elijah’s is doused in water – but then they were praying to Baal and Elijah was praying to the Living God. How emphatic is God! A not dissimilar question to ‘are you going to try to have it both ways?’, even whilst following God. Are we making a splash for God for his sake – or our own? and to listen to other voices. or just done the wrong thing. and not what you want me to do.